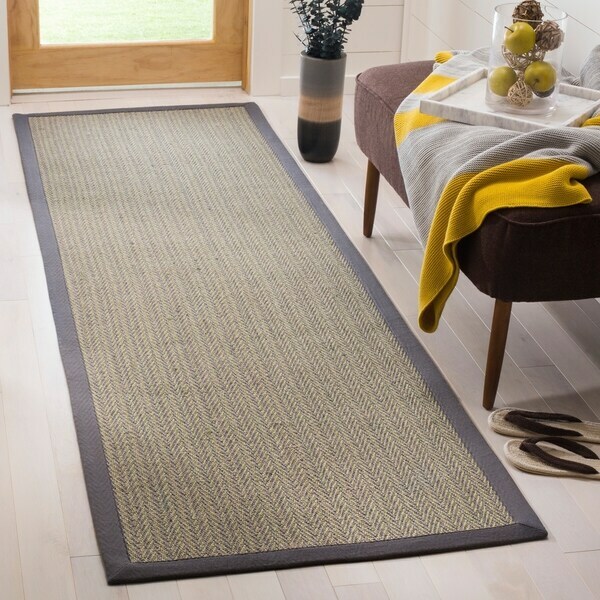 I love this, great useful rug that cleans easily. Perfect for rain or snow as does not retain water and dries quickly. Vacuums easily and doesn't show any stains or dirt. Use it by my front door during the fall and winter. Had it for a couple of years and shows no signs of wear and tear. The product seemed to be made well, but they describe the rug as gray. The gray band around the rug was definitely gray, but the color in the pattern of the rug was more of a greenish color. I returned the carpet because of the off color. I would not recommend to a friend if they were looking for a strict gray color. This runner worked out well for me, however OS does need to change the color description. As previous reviews have mentioned, there is indeed a green strand that goes through the entire weave of the rug. It complements my hallway just fine, but if you just want grey and natural fiber tones, this green may present an issue for you. As always, OS delivered early and the product was in good condition. From far away, it looks grey...close up, it's very interesting because it's a bunch of different colored natural fibers. Slightly scatchy, but exactly what I wanted. This rug was also stained when I received it. Had to be returned. Customer service was very helpful.